Do you "speak insurance?" Luckily, you don't have to. At In Focus Eye Center, Rachael, our insurance coordinator is fluent and can translate the terms for you. Click the link or scroll down to see a list of insurance vendors we work with. Our whole team will make sure you get every penny that you are entitled to. Our optical frame selection is stocked with styles that will help you be fashion forward without letting you look like you are trying too hard. Honest opinions and assistance navigating the frame boards is what you can expect from our experienced opticians. Having a very carefully curated collection of frames means that you won't have to spend all day trying to find something that fits, and you will leave feeling and looking good! You want the very best eye doctor for you and your family. You found her! Dr. Jen is not just the optometrist but the owner of In Focus Eye Center. Since taking ownership of the practice in 2018, she has made it clear everyday how much she cares about her employees and her patients. Schedule an appointment today, for the most thorough eye exam you have ever experience. Give us a call at (404) 589-0822 and we will be happy to answer all of these questions for you. Instead of trying to get answers from an insurance company, let us do the legwork for you. Keep in mind we may know your insurance by another name. For information regarding your specific plan and benefits, or to ask about a plan not listed, please call us at (404) 589-0822 and we will be happy to help. Each frame is hand-selected from among the latest trends. The brands we stock are chosen because they are priced right and made well. All of our frames come with a two-year warranty against breakage or damage. With a collection of over 500 frames there is a frame that will fit your tastes and budget. Our friendly and stylish staff will help make the selection process fun and successful. As a fully licensed and equipped optometric practice, In Focus Eye Center offers a complete range of eye care services to all our patients. Whether the eye care issue involves correcting refractive errors with eyeglass or contact lenses, or helping a student find frames that will not look geeky, our experienced team will identify and implement the best eye care solutions possible. With years of experience in diagnosing and treating typical vision disorders such as nearsightedness, farsightedness, amblyopia, presbyopia, cataracts, macular degeneration and diabetic retinopathy, Dr. Jay Chretien and his team are equipped to provide excellent therapeutic medical eye care. At the same time, we offer a wide array of the very best high quality eye care products at reasonable prices. Our patients never pay too much for the best quality in eyeglasses, contact lenses, sunglasses, progressive and bifocal lenses, and outstanding service. If you are diagnosed with an eye disease, you want only the best treatment available to get your eyes healthy again. At In Focus Eye Center, we offer only the best. Based on your diagnosis, we may recommend a wide variety of approaches, including improved nutrition, prescription medicines, therapy and vision exercises, or medical procedures. Good Eyecare Begins With A Yearly Exam! Although many do not realize it, the best way to protect your vision is with a yearly eye checkup. An eye exam can instantly detect such health-threatening conditions as tumors, vascular irregularities, and diabetes-related injury to the retina. 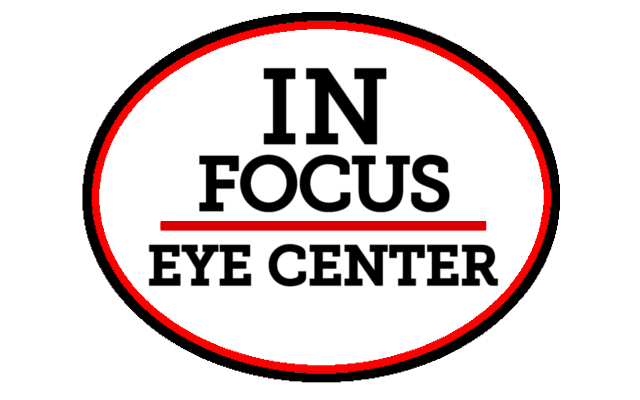 At In Focus Eye Center, that basic checkup is brief and painless.